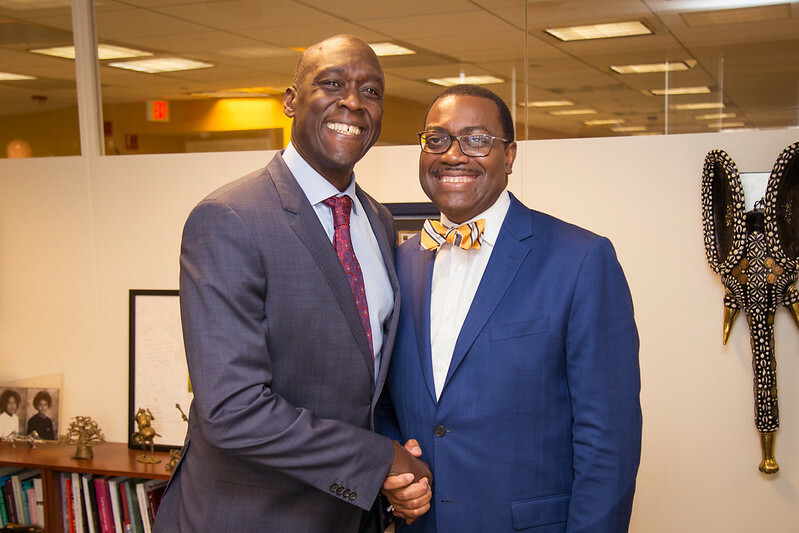 President Akinwumi Adesina will lead the AfDB delegation at the meetings, which will feature important discussions related to private sector development, unlocking financial capital for infrastructure development, food security, climate change, gender, civil society and aid effectiveness, among others. The President will also meet with the Governors of the Bank's regional member countries (RMCs) and conduct bilateral meetings with several non-regional member countries to discuss the Bank's new initiatives and ongoing institutional reforms. On his first day in Washington, on Wednesday, April 19, President Adesina will meet with Christine Lagarde, the Managing Director of IMF and Makhtar Diop, the Vice President for Africa at the World Bank Group. He will be also giving remarks in an event "The Challenge and Logic for Greater Africa" organized by the Center for Global Development (CGD), alongside Ngozi Okonjo-Iweala, former Nigerian Finance Minister; Nancy Birdsall, President Emeritus and Senior Fellow, Center for Global Development; and Antoinette Sayeh, former Finance Minister, Liberia. On Thursday, April 20, Adesina will meet with Melinda Gates, to discuss collaboration opportunities with the Gates Foundation in different fields. Adesina also joins the Heads of Multilateral Development Banks (MDBs) on Saturday, April 22 for the Global Infrastructure Forum. At the forum, heads of MDBs are expected to discuss and explore ways to enhance public and private infrastructure investment and improve alignment between established and new infrastructure initiatives in developing nations. He will also participate a High-Level Meeting on Famine and Fragility co-hosted by Jim Kim, President of the World Bank Group (WBG), and Antonio Guterres, UN Secretary-General. This mission to Washington comes just before a visit to Germany (April 26-28, 2017), where President Adesina will be giving remarks at the Committee for Economic Cooperation and Development of the German Bundestag. The President will also speak at the high-level international conference "One World No Hunger – Future of the Rural World" about the importance of investment for the future of rural areas in Africa, along with Gerd Mueller, the German Development Minister. President Adesina has often emphasized the importance of transforming rural areas in Africa through skills development, job creation and youth economic empowerment. "These zones of misery must be turned into zones of economic prosperity," he said. "For this to happen, investment for rural finance, largely for agriculture and agro-aligned industry, as well as ICT, must be a central strategy."